Frankie Dettori rode his first winner of the Betfred Ebor as Willing Foe came out on top in a pulsating finish to Europe's most valuable handicap at York. Having finished third on his seasonal reappearance at Ascot last month, the Godolphin runner was a 12-1 chance for this prestigious one-mile-six-furlong test and Dettori made sure his mount was never too far off the pace in mid-division. 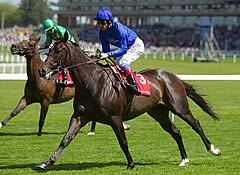 He came to throw down his challenge in the home straight and though Irish raider Royal Diamond looked a serious threat as they flashed by the furlong marker, Willing Foe gave Dettori everything to pass the post a neck in front. Royal Diamond ran a stormer to finish second, with Number Theory and staying-on favourite Motivado rounding off the places. Dettori said: "It's taken 25 years, but my day has come. I was a bit worried about the draw, but they went slow and it worked out. I thought I had a chance, but it's the Ebor and I have never won it before. "This is one of the most important handicaps of the season and now I've conquered it. I didn't have many boxes to tick, but this was one of them. I know it's only a handicap, but it's a very prestigious race and it's always a great crowd here. "It's a funny old game, 24 hours ago I was sat in a car with the doctor (after a fall)." Winning trainer Saeed bin Suroor added: "We decided to come here after his last run at Ascot, when he was third. We thought a mile and six (furlongs) would suit him well. His last piece of work was really good and it gave us confidence. "The options are open for him. We'll have a look at everything, but he is a possible for the Melbourne Cup. We've got a few in it, but I think the trip would be perfect for him."